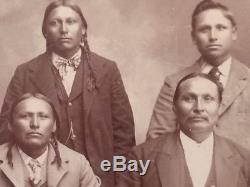 Historically unique lot of original 1902 cabinet card of Native American Indians from the Chickasha Indian Territory of Oklahoma taken by Indian photographer Irwin with a letter identifying the Indian men in the photo which was signed by GW Hicks. He documented the Chiricahua Apache, Comanche, and Kiowa who lived near Anadarko Indian Territory and Fort Sill. The letter is dated 1902 as is the back of the cabinet photo. The names of the men in the photo are on the back but there is a discrepancy in names between the letter and the card. 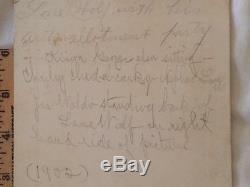 The letter is signed by GW Hicks, the pastor of the Kiowa Elk Creek Baptist Church started by Hicks after graduating from the Indian University and the Rochester Theological Seminary in 1893. Chief Lone Wolf was a deacon at the church. 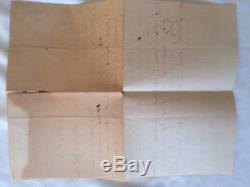 The letter has typical age discoloration, has been folded into quarters, has a wear tear in the middle of the letter, and a tear at the top center along the top center. 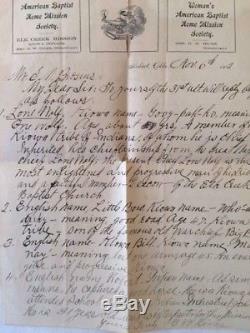 Names mentioned in the letter are Chief Lone Wolf, Little Bow, Kiowa Bill, and Robert. 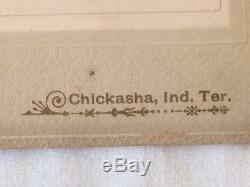 Their Kiowa names are respectively mentioned. 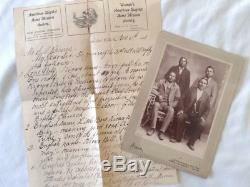 Written on the back of the photo are the names Lone Wolf, Kiowa George and his nephew, and Jas (or Jos) Waldo. The item "RARE 1902 CABINET PHOTO of KIOWA CHIEF LONE WOLF & OTHERS CHICKASHA INDIAN TERR" is in sale since Sunday, March 04, 2018. 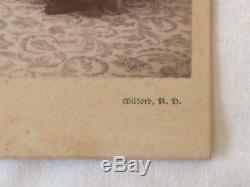 This item is in the category "Collectibles\Cultures & Ethnicities\Native American\ US\1800-1934\Photographic Images". 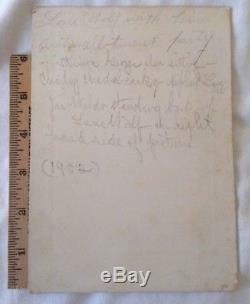 The seller is "joluka" and is located in Greenbush, Michigan. This item can be shipped to United States, Canada.